One of the reasons to love the instant pot is perfectly cooked rice. Being a north indian, I prefer white basmati rice over any other variety of rice. You don’t need to keep that extra rice cooker anymore and can free the counter space. 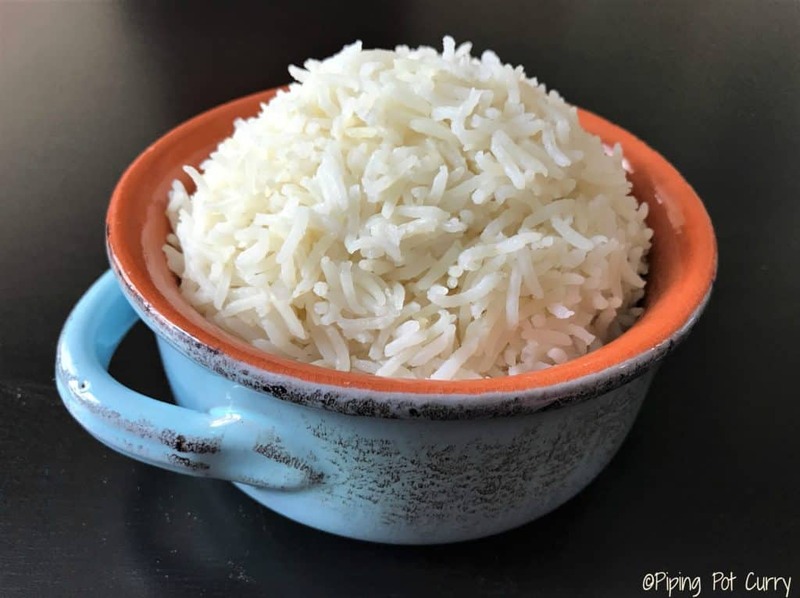 Try this perfect Instant Pot Basmati Rice. Basmati is a variety of long, slender-grained aromatic rice from the Indian subcontinent. This variety has gotten very popular all over the world, with India and Pakistan being the largest exporters of this rice. 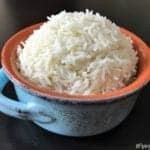 How to cook perfect Instant Pot Basmati Rice? Cooking rice needs perfection on the amount of water and time. With this recipe, you can make perfectly cooked basmati rice. Just soak the rice, 4 minutes manual in the instant pot and 5 minutes natural pressure release. Sounds easy…it actually is! I like to have rice al dente, and separate. I don’t like sticky or mushy rice. That said, everyone has different preferences for rice, so feel free to adjust the recipe to your taste. I soaked the rice for about an hour and used a rice to water ratio of 1:1. Soaking for 15-20 minutes or not soaking them works too. Although researchers say that soaking rice overnight helps reduce toxins by 80%. If you have the time, soak them and rinse before cooking. That said, there have been times when I have forgotten to soak the rice, they still come out great. If you end up not soaking the rice, then you can increase the rice to water ratio to 1:1.25 cup. Traditionally cooked basmati rice in a saucepan needs double the water amount than the rice. However in the instant pot, less water is enough to get perfectly cooked rice. Enjoy this perfect basmati rice with any Indian curry such as Chole Masala, Chicken Curry and Dal Makhani. 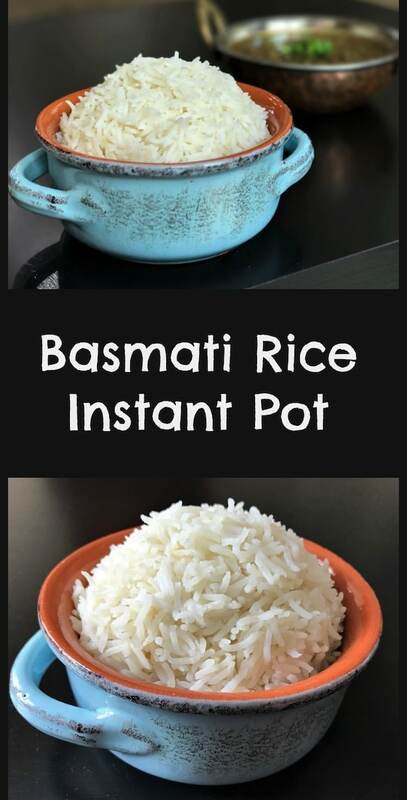 This recipe works perfectly if cooking rice in the main pot. If you are doing pot-in-pot (PIP), then you need to cook for additional time. Check out the pot-in-pot rice recipe. Try out the basmati rice and let me know if this works for you. A simple variation of basmati rice is Jeera or Cumin rice. Want to make Brown Rice in the Instant Pot? Check out the recipe here. 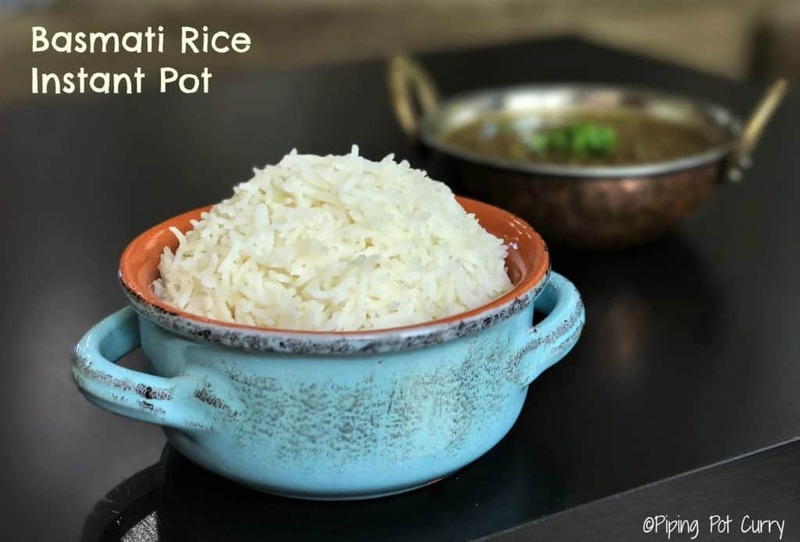 Perfectly cooked Indian Basmati rice made in an instant pot or pressure cooker. 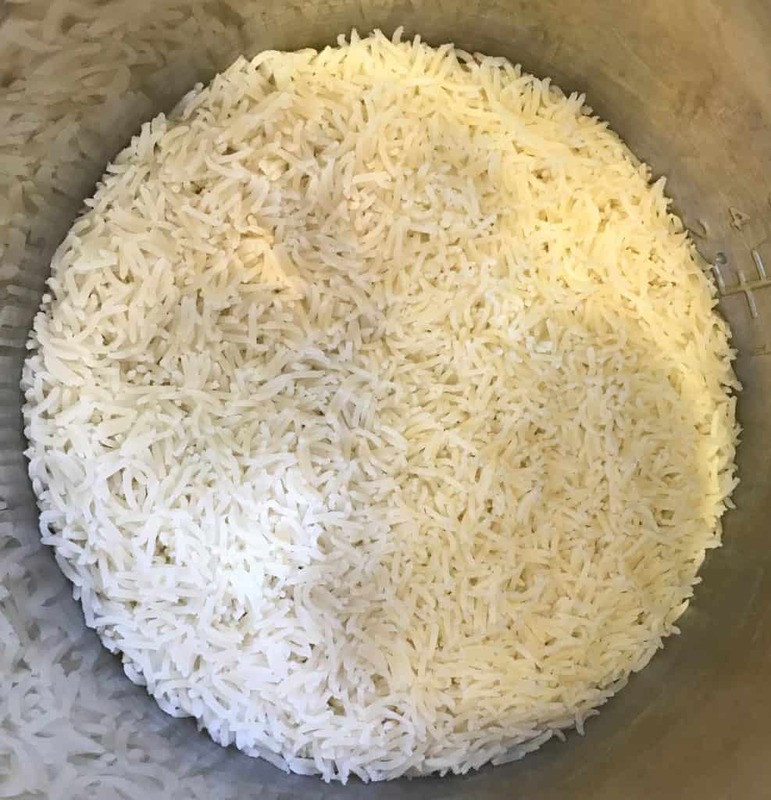 Wash basmati rice until the water runs clear. If soaking, soak the rice in excess water for 1 hour. After the soaking time is done, rinse the rice. Add the water and rice to the instant pot. If using, add the ghee and salt. Start the instant pot in manual or pressure cook mode for 4 minutes at high pressure with vent in sealing position. When the instant pot beeps, do 5 minutes natural pressure release, which means release the pressure manually 5 minutes after the instant pot beeps. Fluff the rice with a ladle or fork. Let them stand for 5 more minutes. Rice is ready to be served with your favorite curry. I add 1:1 rice to water ratio in this recipe as I soaked the rice. You could change the rice to water ratio to 1:1.25 if not soaking the rice. If you like very soft rice, then you can increase the water to 1.5 cups for 1 cup of rice. Wondering why the rice setting isn’t chosen? I find it prevents the problem of sticking or overcooked rice with the simple press of one button and waiting just a few minutes to release pressure. Am I missing something? Thank you. The rice timing was perfect!!!! Hey Halona – Glad to hear. Thank you for sharing your rating. Came out very good. Used a TBL of butter and tsp of Better Than Broth Roasted Chicken flavor. Basmati was very well rinsed but not soaked. 1:1 rice water ratio and the cook and pressure release times were spot on. Hey Tom – Wonderful variation to the plain basmati rice. Thank you for sharing! For natural release, do you let the instant pot go into keep warm mode or cancel it? Because, I’ve done it this way with soaking, without soaking, adding a tbsp of ghee and while the rice is fine, it sticks to the pot. If I am near the instant pot, I do cancel out of the keep warm mode, as that also helps for the pressure to release sooner. Also, if you have trouble with rice in the main pot, try pot-in-pot. That may give better results. Hello. What is the maximum cups of rice can I cook in an IP-LUX60? Thanks! Hey Namrata – I have only made 2 cups at a time. However I have seen posts in instant pot groups where people have made even 6 to 8 cups in a 6qt. By 1 cup of rice and 1 cup of water, are you meaning a standard 1 cup measure for both? Or the rice cup version of 1 cup, which is really 3/4 cup? I usually use the standard 1 cup for both rice and water. The main thing is keeping the rice and water ratio, you could use any size of cup. Hi! What if I do want softer rice? Not mushy, but softer. The rice I made last night in the IP (basmati, as I’m also North Indian 😉 ) came out al dente, which is not at all to my taste. Would I add more water? If so, how much, do you think? Increasing the amount of water to get softer rice. You can try 1 cup rice to 1.25 or 1.5 cup water. The cooking time should remain the same. It’s my understanding that unless you turn IP off after cooking time, the IP goes to ‘warm’ not off… so that wouldn’t actually be the same as Natural Pressure Release which is done after turning the IP off completely. Does that make sense? Do you shut your IP off after the 4 minutes of pressure, or let it go to warm for 5 minutes, and then release the pressure manually and serve? Hi Kate…I usually let it be on warm mode, so I can see the timer. Then after the 5 minutes, I turn it off.